If you have recently inherited money after filing bankruptcy, you may be wondering what happens to that money. Inheritances are treated differently depending on when it is received and what type of bankruptcy has been filed. Section 541 of the Bankruptcy Code describes property of the estate and mentions only those inheritances acquired within 180 days after filing a petition. 11 U.S.C. §541(a)(5)(A). However, while this is the end of the story for chapter 7 cases, a case filed under chapter 13 also has to tend with §1306(a)(1) which states that property of the estate includes everything listed in §541, and all property acquired by the debtor after the filing of the petition but before the case is closed. Although an inheritance is part of a bankruptcy estate in a Chapter 13 case, that is not to say that the inheritance must be turned over to the creditors. Section 1327(b) states "confirmation of a plan vests all of the property of the estate in the debtor" and §1327(c) states that property vesting in the debtor is "free and clear of any claim or interest of any creditor provided for in the plan". 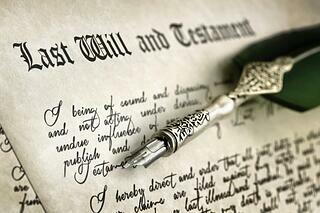 So if the inheritance is free of creditors' claims, what is the concern? The concern in a Chapter 13 case is that a Chapter 13 Plan requires all of debtor's "disposable income" to be applied to make payments. 11 U.S.C. §1325(b). Thus, the trustee may seek to modify the Plan based on the argument that there has been a substantial change in circumstances that has resulted in the debtor having extra money to be able to afford to pay more to creditors. As is most things in bankruptcy, the outcome is fact specific and there is case law that has decided the issue for and against the debtor. For help from our personal bankruptcy lawyers with your specific situation, contact us for a free bankruptcy consultation today.